A castoff wide receiver from the Miami Dolphins, Chicago-area native Gary Fencik was acquired by the Bears in 1976 and quickly was switched to safety. By 1977, Fencik was starting in the defensive backfield with fellow safety Doug Plank, a duo dubbed the "Hitmen". And hit they did as the Plank/Fencik combo was known and feared throughout the NFL. Fencik played free safety, and while the strong safety next to him changed many times (from Plank to Todd Bell to Dave Duerson), Fencik missed very few games in his NFL career. He made the Pro Bowl in 1980-1981 and was named to the all-NFL team the latter year as well. A play etched in Bear fans' memories was the vicious hit he put on a Redskin during the 1985 meeting between the two teams at Soldier Field, when Fencik went airborne to level his opponent. 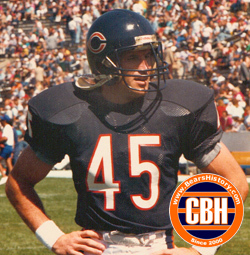 Fencik's retirement in 1987 was overshadowed by that of teammate Walter Payton, but Fencik was still honored on the field as a rare Bear. He retired at the Bears' leader in interceptions (38) and tackles.